Three-row crossover SUV shoppers are able to be more and more picky as the class progresses. With such a dizzying array of viable options, many consumers don't know where to start with the SUV-shopping process. 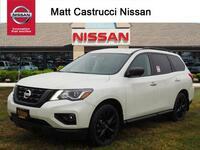 But that's where our team at Matt Castrucci Nissan comes in! We're here to help with every step of the car-buying process, so if you're looking for a three-row crossover SUV that's not cumbersome to drive but has plenty of interior space? 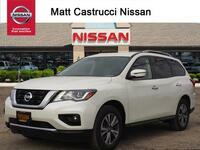 Let us introduce you to the 2018 Nissan Pathfinder. 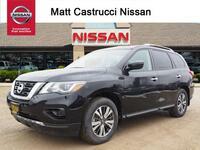 The 2018 Nissan Pathfinder comes in four trim levels: S, SV, SL, and Platinum. All four trim levels come with a powerful yet fuel efficient 3.5-liter V6 engine that offers a maximum output of 284 horsepower and 259 pound-feet of torque. And yes, you read that right. The impressive engine comes standard on every trim, meaning you won't have to pay extra for the engine even on the base model in the lineup. Interested in learning more reasons that the 2018 Pathfinder is our top pick in the three-row crossover class? Keep reading! Whether you prefer to drive on paved road or you would rather stray off the beaten path, the 2018 Nissan Pathfinder has you covered. It comes with three drivetrain options: 2WD, 4WD, and Auto Mode, which give drivers confidence behind the wheel no matter what road conditions lay ahead. Have a sizeable crew or growing family? That's no problem for the 2018 Pathfinder. The three-row SUV still has 16 cubic feet of cargo space when all seven seats are occupied, but if you need more trunk space, drop the third row of seating to open up 47 cubic feet of open space in the trunk area. 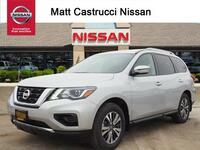 Despite its large interior, the 2018 Nissan Pathfinder is surprisingly fuel efficient. In fact, models equipped with front-wheel drive have an EPA-estimated fuel economy rating of 27/20 MPG city/highway, which keeps the three-row SUV at the top of its competitive class. 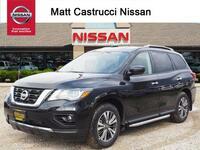 SUV shoppers looking for more information about the 2018 Nissan Pathfinder are encouraged to contact a member of our team here at Matt Castrucci Nissan or stop right in and see us at our location in Dayton. Those ready to get behind the wheel of the 2018 Pathfinder are invited to schedule an obligation-free test drive online today!